Johanna Quaas, 86, isn't taking old age lying down. Instead, she's taking it spinning, jumping and twirling -- on the parallel bars, no less. Quaas wowed the audience at the 2012 Cottbus World Cup in Cottbus, Germany, according to the Post Chronicle. 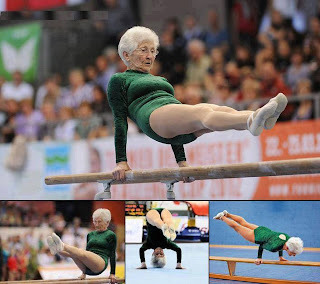 Clad in a green leotard, she performed exhibition displays on both the floor and parallel bars. 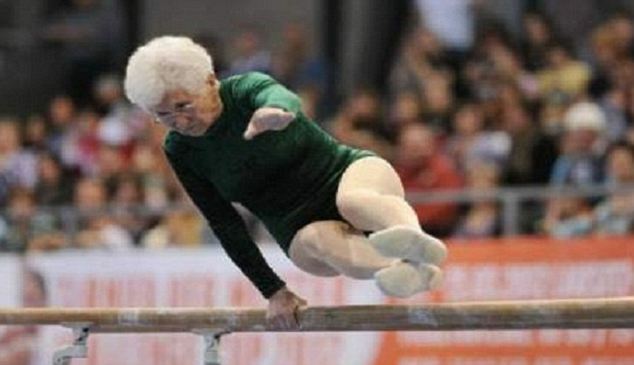 Though the white-haired wonder has won 11 medals in senior gymnastic competitions, MSNBC reported, she currently practices gymnastics "just for fun." It should be no surprise that this German octogenarian has a long history of athletic excellence. In 1954, Quaas was a member of the handball team that took the Eastern German Championship, she told Gym Media.